October 26, 2001 The dry fall breeze ushers in the smell of burning leaves, rushing schools of mullet, and Leonard on his sailing skateboard. With creative geniouses like him on board, no wonder the Cherokee project is rolling right along. The crew has made a few preparations for winter. 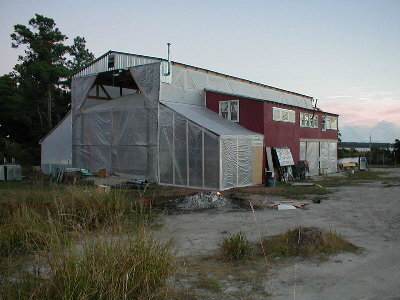 They took two hinged panels of the shed, raised them, and wrapped them in plastic to create two shed roofs one either side of the building. One is the sanding room, and the other is the paint room. 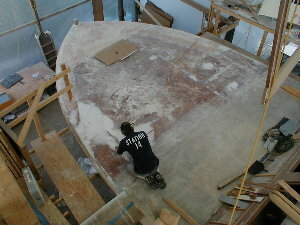 Bill Davis is shown below sanding the vessel foredeck in preparation for fiberglass. 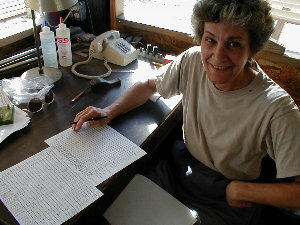 Jeanette, when not sanding, sawing, or gluing, has been working on a spread sheet for the project’s labor analysis. Good thing she wears that reversible white and blue collar. 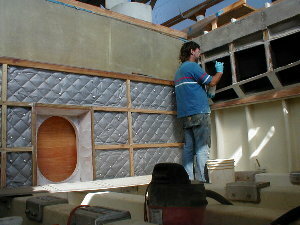 The crew has been installing sound insulation in the engine room. It started in the Huckins boatyard fifty three years ago, when a three quarter inch plywood structural bulkhead was placed in the hull to separate the engine room from the rest of the boat. 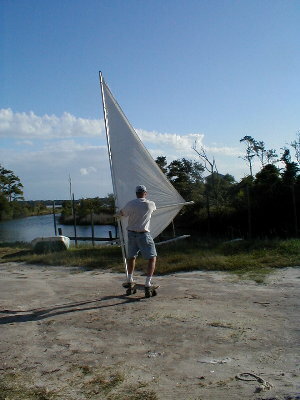 The Cherokee crew then built on that by gluing a three quarter inch piece of Divinicell to the quarter inch plywood bulkhead. 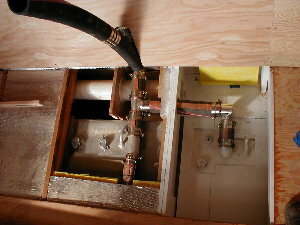 The Divinicell is used to decouple the bulkhead from the engine room and cockpit area. 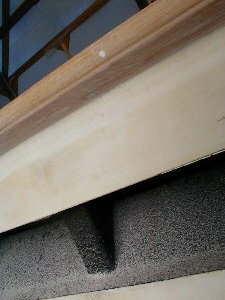 Next came a layer of 1808 fiberglass cloth layed up with West System epoxy resin. To that, the crew glued a piece of quarter inch lead-impregnated vinyl dampening mat. This massive mat acts to absorb deeper vibrations by its sheer mass. One and a half by four inch stanchions were placed against this lead mat and are bolted into the engine stringers below. These stanchions are glued to the mat with a rubber adhesive (5200), and will support the cockpit deck. The areas between the two by four stanchions are filled with four inches of fiberglass batting. Next, quarter inch vinyl tough mat attaches, and then two and a half inches of additional wood framing encompass another two inch quilted batt of fiberglass. This all will be covered with a thin perforated aluminum sheet. 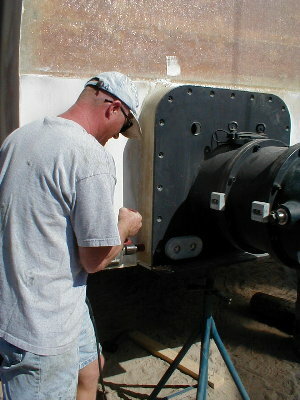 Leonard is permanently installing the water jets. He’s shown here placing nuts and bolts in the pockets. The pockets are then filled with expoxy resin with high density filler, encapsulating the nut and machine bolt. 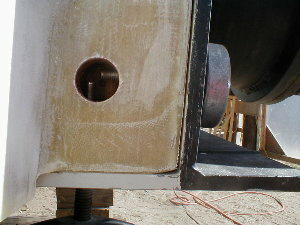 The machine bolt has been waxed so that it can be removed after the epoxy dries, making a threaded hole in the hull. This hole will be for the machine screws that hold the jets in place. Alien space pods multiplying in a hot zone? No – the picture below is of the Centiflex coupling, which will attach the water jets to the engines, freshly painted and drying. 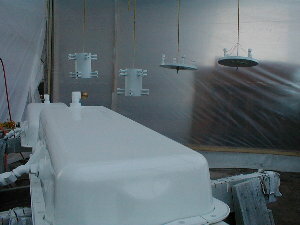 In the foreground is a newly painted oil pan. Pictured to the right is one of the air intakes along the side of the hull. 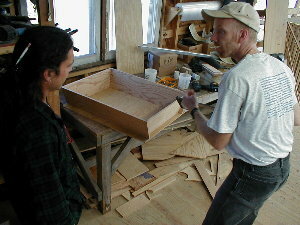 Tom is building a plug that will cover the engine room emergency access hatch. The plug itself will be full of sound abating insulation as well. Norm, when not working on the engine room insulation, is installing fuel fill lines for the three diesel tanks. All fuel tanks are piped together so that they can be filled from either the port or starboard side. All in all, they will carry a grand total of 1,650 gallons. 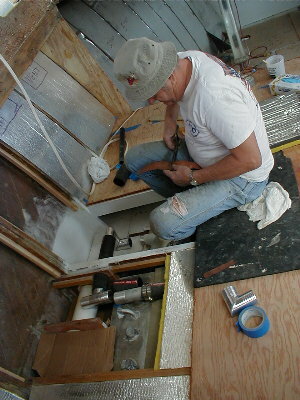 Tom continues his work on the plumbing and head areas. 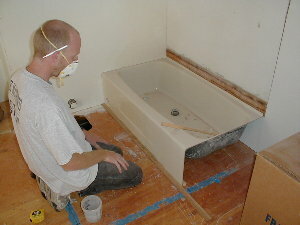 He is installing the bathtub in master head, which looks way smaller here than actual size!